Update 2015 : I believe this pattern is not available anymore due to the VAT regulations on digital downloads in the EU. Please contact customerservice@fatquarterly.com if you have specific questions. Finished just in the nick of time! I'm not sure why I continue to do this to myself year after year, but once again I started a project for Christmas just days before needing it to decorate. 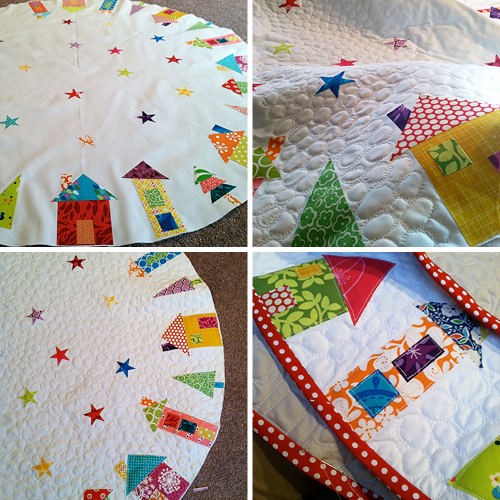 All year I told myself I needed to make a new Christmas tree skirt. Our old one was pretty cheap and junky and literally falling apart. Last Friday I decided to "whip one up". Ha, famous last words, right? I knew I wanted to make this particular pattern after seeing it in last year's Fat Quarterly Holiday Special. This pattern was designed by Brioni Greenberg. I think I was delusional in thinking this project would only take me a few hours. Friday I spent the day cutting and placing the houses. 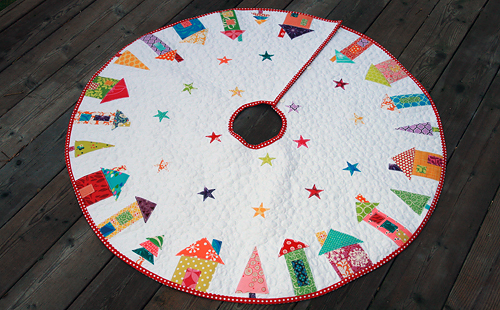 Saturday I spent the day pebble quilting. I ran out of thread in the middle and had to stop and go to the store. Sigh... This quilting technique took a long time, but after seeing Brioni's example, I had to do it. It is SO cute and my daughter thinks it looks like clouds. I also spent some time Saturday stitching down the houses. 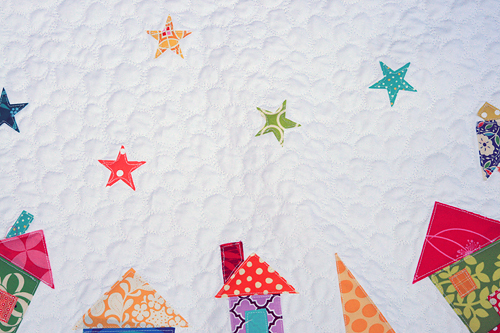 I finished those and the stars up yesterday and also added the binding. 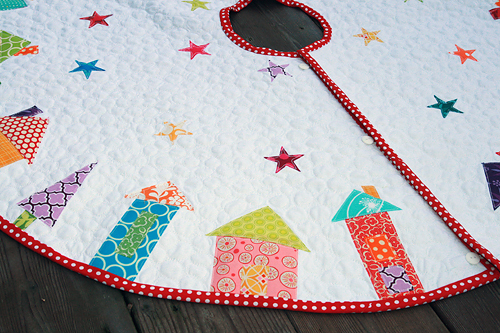 I used a red polka dot print by designer Sarah Jane's Children at Play line. 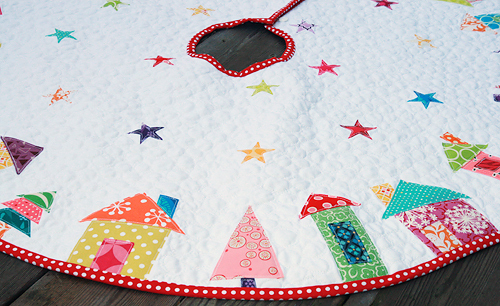 Overall I'm really happy with how this tree skirt turned out. The pattern was fabulous. Well worth the $5 cost of the issue. I know this particular holiday decoration will be getting years of use at my house. Things will be quiet here on the blog for the next few days as I take some time away from the sewing machine and enjoy being with my family. Wishing all my US readers a happy Thanksgiving!